Yes, it’s that’s time of year again. It’s National Poetry Day in the UK. Here are a few posts I’ve read this morning which you might also enjoy. Jo Bell, meanwhile, is characteristically optimistic and upbeat about the whole affair and rightly points out that NPD is all about bringing more poetry to more people. There are events across the UK and certainly all over social media – follow the #NationalPoetryDay hashtag and your timeline will flood with poetry. A sobering article by Andrea Brady reflecting on the persistent lack of diversity in British poetry, ‘The white privilege of British poetry is getting worse.’ This is hard reading for any poetry publisher or events producer striving to widen their poetry list but the facts and figures can’t be argued with. With this in mind, you might like to follow BHM Poetry on Twitter @blackhmpoetry which is tweeting a poem a day by BAME poets for UK Black History Month. What are your thoughts about NPD? In previous years, I’ve run free workshops in community settings but this year I’m preoccupied with other stuff, including my own writing. So I feel slightly out of it. Perhaps I’ll do better next year and make more of an effort to get involved. Any thoughts or links you’d like to share? Enjoy the day and I’ll see you on the other side! 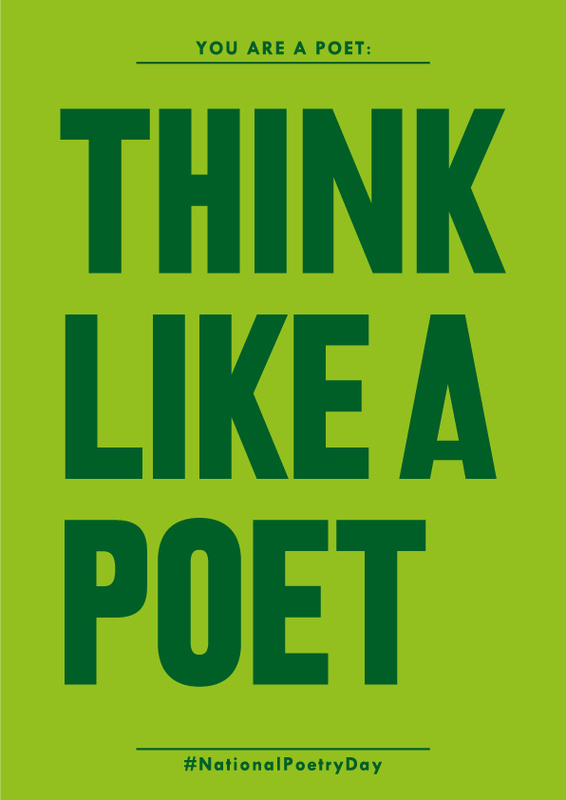 And if you like the poster at the top of this post, by the way, go to the National Poetry Day site where there are lots of beautiful free downloads and posters. I am presenting my staff meeting notes in rhyming couplets this afternoon. I hope it works, from David Birks.